In August I attended the Pateley Bridge 1940s weekend, the first event of it’s kind to be held in the small Yorkshire town. As always at these event, there were many re-enactors representing the different parts of the armed forces, plus civilians in appropriate attire. As usual I took with me the Mamiya C330F, along with both the 135mm and 80mm lenses. The film of choice was quite tough, with there being a rather cloudy grey sky throughout the day. I decided on FP4+, aiming to keep the image quality at it’s highest. As this event was right in the centre of the busy thoroughfare of Pateley Bridge, photographing without modern distractions in the background was even harder. Although there were areas where there were few distractions, the main part of the event was right in the centre of the town. Luckily, the buildings in Pateley Bridge are rather quaint, meaning that shooting at in a low level TLR style could avoid many of these distractions. 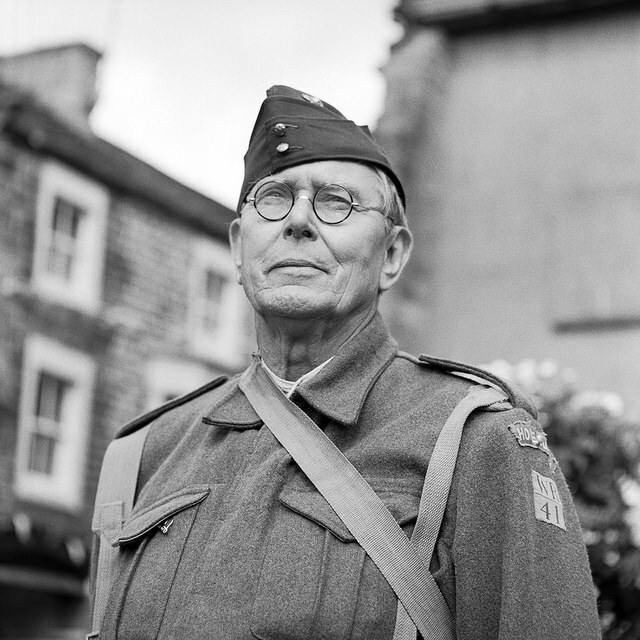 A home guard soldier in the centre of Pateley Bridge. Often the look in the eyes is what creates the emotive part of the photograph. The look in people’s eyes often sets the emotive tone for a photograph. In this image, the distant look to the skies of the Home Guard soldier creates it’s own narratives, making the viewer wonder what he is looking at, thinking, and what his history is. Decommissioned weapons often feature heavily in 1940s event, usually including Sten guns, Bren guns, hand grenades and other World War Two weapons. Getting soldiers to interact with these can produce more threatening, serious photographs. 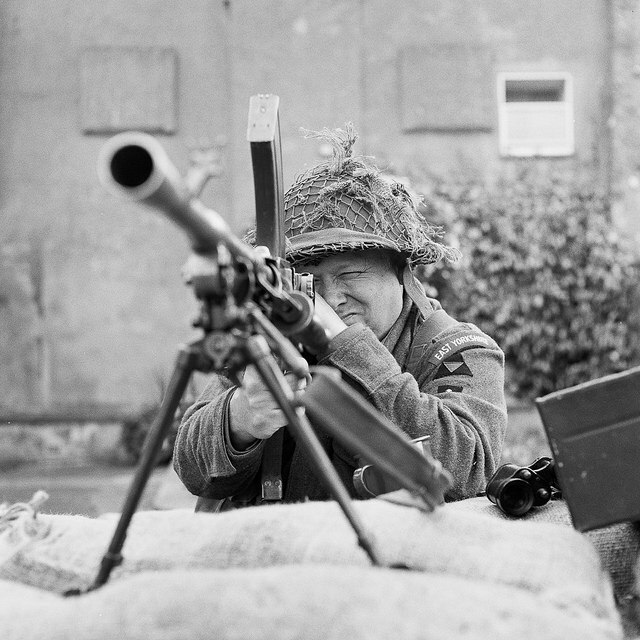 A home guard soldier looking down the sights of a Bren gun makes for an image that mixes the quaint village with a deadly weapon. In this photograph there is a juxtaposition between the quaint village and the menacing stance of a soldier looking down the sights of a machine gun. I often like to play with this threatening mix of subjects which lies under these events. Civilians at 1940s event oftent look at least as good as or possibly even better than the soldiers in uniform, and provide just as intriguing a subject to photograph. A gent in a leather jacket really looked the part as he leant against iron railings in Pateley Bridge. 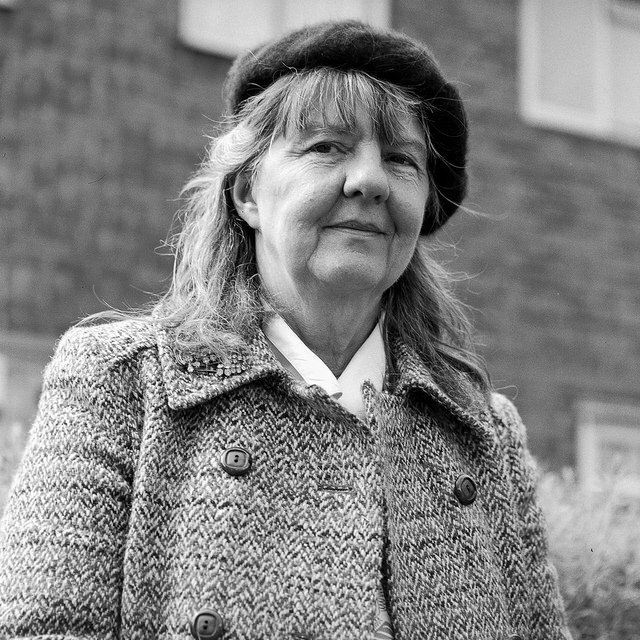 The different textures of clothing really brought out a great range of tonality, adding depth to the photograph. 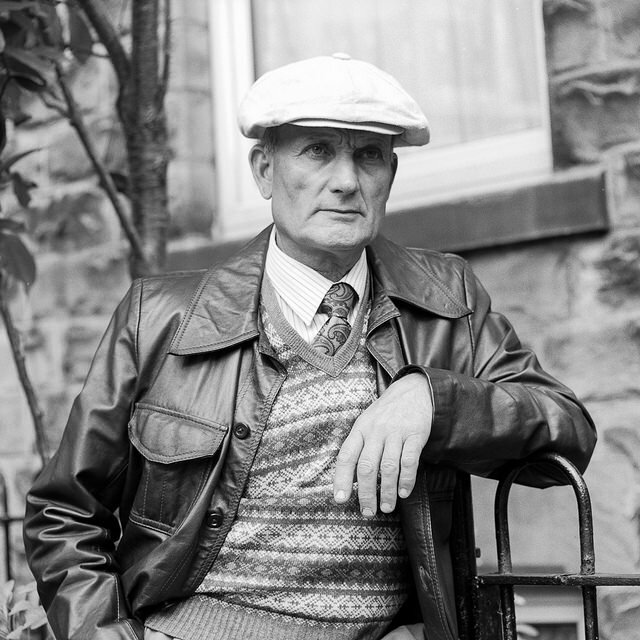 This gent in his leather jacket was one such example, as the depth of tonality from his clothing worked really well in the image. Again, the distant, far away look allows viewers to come up with their own narratives about who this person is and what they have experienced. The Ladies at Pateley Bridge also made plenty of effort in selecting suitable clothing for the 1940s event. One of these people included singer Kitty LaMere who entertained the crowds with a variety of songs from the era. Kitty LaMare striking a post at the Pateley Bridge 1940s event. I really liked the combination of the taped up windows in the background, and the vintage look of Kitty’s hair and outfit. I really liked the look of this image, with the outfit, background, expression and pose all coming together to create an intriguing composition. 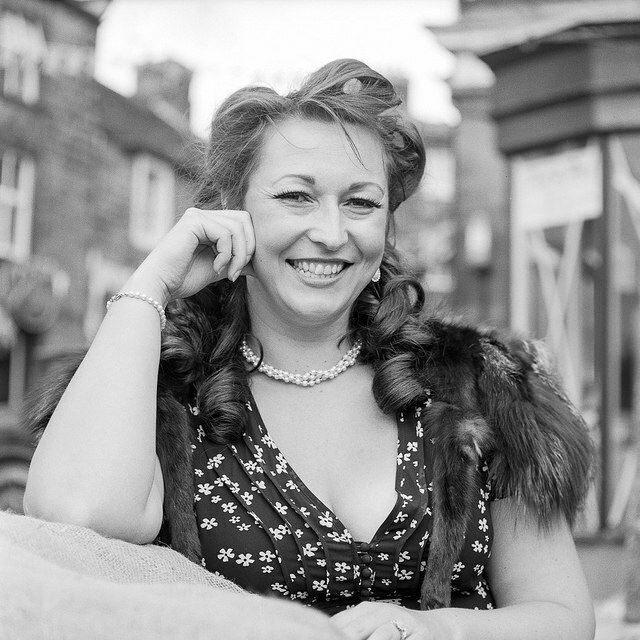 Another lady provided a great subject at Pateley Bridge, although with a much less glamorous outfit. This lady was selling junk items off a small wooden cart outside one of the houses by the main street. The textures and expression in this photograph really make the photograph stand out, and the lighting across the face created good tonal depth and shape. I thought that the mix of textures and lighting on the lady’s clothing and face made an image with real depth. The detail that the medium format camera and high quality lens has captured creates a very real, three dimensional image. The Pateley Bridge 1940s event was a great day out, with a lot packed into such a small space. There were plenty of photo opportunities with the re-enactors, even if the constant flow of traffic did spoil the look of the event somewhat. Despite this, I look forward to returning to Pateley Bridge in the future. You can see a full range of photographs from Pateley Bridge in my Pateley Bridge 1940s event album on Flickr.